Should you get the flu vax? Plus some tips to survive winter! Seems the topic on every body’s lips right now (or so my inbox tells me), to flu vax or not to flu vax? Now, we all know this is a super controversial topic. Before I go on, this blog is a place where I write to allow others to make informed decisions. So, with this in mind any comments you choose to leave please do so openly with respect for all involved in the discussion. Rude comments will be removed. Now that is out of the way, I have to say, the marketing behind the vaccination this year astounds me. It’s on the radio, in the papers and everybody seems to be asking if it’s a good idea – everybody seems to be telling us that it is and that we need to get onto it stat! Now I’m mad for the proactive approach rather than the reactive – preventive medicine is certainly where it is at for me. However sadly, there are a few missing points that we aren’t necessarily considering when lining up for our flu jab. The fact remains, we all get sick. When our body systems are weakened or impaired as a result of being overworked, stress, tired or living a toxic lifestyle. This is a normal body function. Being sick helps to give our immune systems a boost and is a very important part of building wellness. Whilst nobody likes to be sick, for most people colds and flu’s aren’t dangerous. In fact, it’s a gentle sign that we need to apply the breaks for a while, to rest up and allow our bodies recovery time. Constitutionally, some of us are undoubtedly stronger than others; some of us are born with weaker guts, poorer immunity or weak lungs. No matter your constitution, one thing remains – we need to be able to pay attention to the signs and symptoms our bodies feed us each and every day and act on these to improve overall health. This is being proactive. Unfortunately vaccinations do weaken our systems. In a perfect scenario, simply introducing a very small amount of the flu virus into our systems to help us build up immunity sounds like a pretty good theory. In many situations, people who are vaccinated against the flu, still develop the flu – because if they are weak to begin with, their defenses are even further hit. The biggest problem is that when a small amount of the virus is introduced to the body, the system doesn’t get to fully respond to fight off the virus. The body goes through a series of events to fight illness – all necessary and equally important. Symptoms, although not always nice are actually an integral part of the healing process. Fever is important just as is mucus – they are all natural reactions and responses in the flight toward wellness. For the body to not be able to fully fledge the symptoms and reactions to a virus is where the problem lies, not to mention the strain that vaccinations place on gut health and essential bacteria growth. All medications place load on the gut and upset the vital balance. So say you decide not to vaccinate – it’s important to equally prepare our bodies. Building the immune system and overall wellness is important every single season of the year, not just over winter. We do this by way of feeding our bodies with nourishing foods including bone broths, probiotic and fermented foods, greens, super foods, and plenty of good quality water. Adding spinal care and acupuncture to the mix is without doubt the icing on the cake to have the immune system well supported. Say you decide to vaccinate – these things are even more so important to help your body cope with the virus. Just because you’ve been vaccinated, doesn’t mean you are now superhuman and can live an unhealthy life in the meanwhile whilst you watch everybody else get sick. Chances are, you’re just as likely to fall prey. Reality is, all of us are still human and susceptible to the flu, vaccinated or not. What’s more, we can’t know what 2014’s flu virus strains actually are until the virus itself evolves, and so immunising becomes somewhat questionable if it is based on viruses gone by. It’s also important to remember a few things should symptoms of the flu begin to develop. Suppressing the symptoms with the use of medications will only further lengthen your recovery – again, the body needs to fully express symptoms to pave the way to recovery. I get that it isn’t nice to feel sick but when we allow our bodies to ‘do the job’ the symptoms usually pass at a rapid rate rather than linger on for a long time. And then of course, being mindful that treating symptoms isn’t actually treating the root cause of the illness is of most importance. I encourage you to make a conscious effort right now to prepare your body for the colder months ahead. It will, for some mean some changes to the diet, switching to gentler exercise and movement in the cooler months, resting and sometimes sleeping in and boosting your diet to pump up the immunity. When all is said and done, these changes are never going to have a negative outcome – being the healthiest version of yourself is something I’d encourage you to strive for everyday not just in response to preparing yourself for winter. Be informed, do your research and work out what is right for you. 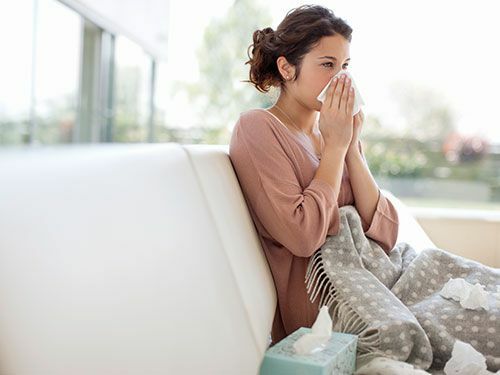 In most cases, the flu isn’t going to damage your body and you’ll quickly recover and be kicking goals again in no time. Yes! Have had my jab. I am tip top health and fit (would give you a run for your money Nat). About 6 years ago I had the flu and was bedridden for 8 days. For the next 3 weeks I was still recovering. I lost 6 kgs, not great as I find it difficult to put on weight. A colleague of mine had the flu, it attached her heart so badly she now has Cardiomyopathy and is on the transplant list. One of my very close girlfriends got the flu whilst pregnant and ended up in intensive care where she delivered a stillborn baby. Will always be getting the flu jab. While we’re on tje topic of vaccinations, I wonder what you think about general immunisation programa.. big topic! Miriam – nothing is a one size fits all and there in lies the problem. Well said Nat! Why are people so scared of sickness, or as I like to call it, health expressions. We’ve lost the art of trusting our bodies and letting them do what they need to do to get back to full health. I love how you have also given people some good examples of what they can do to live at optimal health. Great info, Nat! I am on the flu vax side, though. But I very much agree with you on the fact that we all get sick, we’re not superhuman or immortals not to. To flu vax, or not, we should always take good care of our body, eat healthy and maintain a well balanced lifestyle. After all, prevention is better than cure. I live in the US. I do get the flu vax each year. I’m not sure if the news hit AUS this year but many young, fit, healthy people who weren’t vaccinated either ended up in the hospital this year or died from complications of the flu. I did end up with what my Dr called “flu light” even though I was vaccinated. I couldn’t get out of bed for over a week and it actually took me over a month to stop coughing. The Dr said I certainly would have ended up hospitalized without the vax. I am a health coach- eat organic foods, do yoga etc. We need to all remember that the flu is a dangerous virus that has killed millions of people over the centuries. Vaccines were considered a miracle when first introduced. I’m not sure why they have become so evil in the minds of people this century.